It’s time once again to join together with some of my favorite blogging friends to bring you a fun themed furniture makeover. This month’s theme is flowers. Last month’s theme was “Bold”. I redid a $5 yard sale chair. The theme for the month before was “Metallic”. I shared a thrift store side table. I found it a bit more challenging to incorporate flowers into a piece of furniture, but I think I pulled it off. 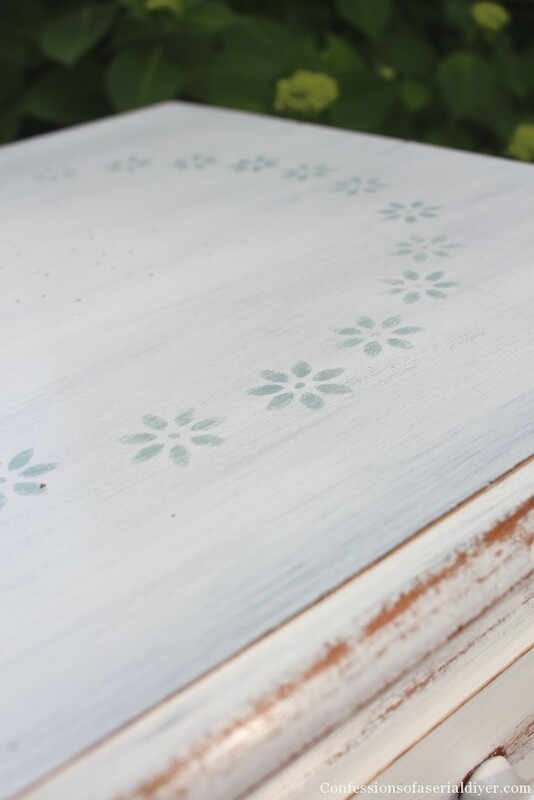 Perfect for a new paint job and a pretty stencil! It still could use one more coat for complete coverage, but I wanted to sand quite a bit anyway so I stopped there. 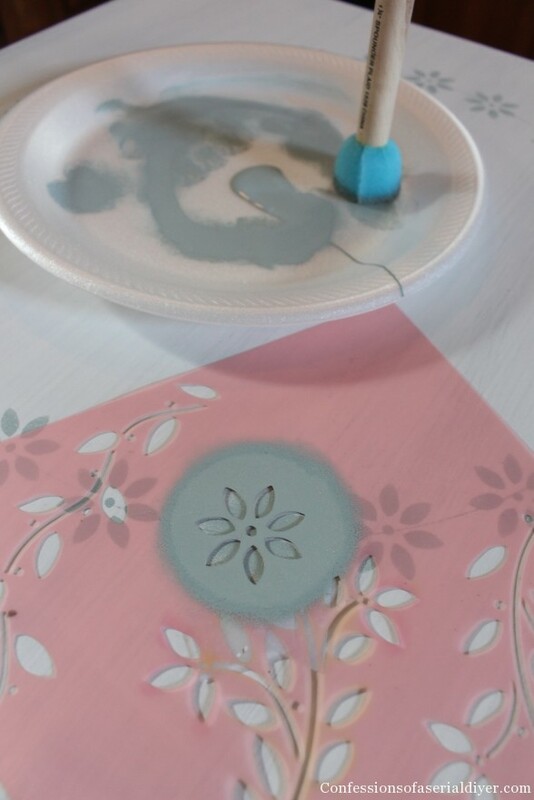 Then I stenciled my flowers in ASCP in Duck Egg blue all along the circle. This is a stencil I bought years ago. I felt like the bottom shelf needed something, but I decided to leave it alone since it will likely be covered anyway. My hydrangea in the background are just getting set to open up. I can’t wait to fill my house with their beautiful blooms! Hope you enjoyed this little makeover. 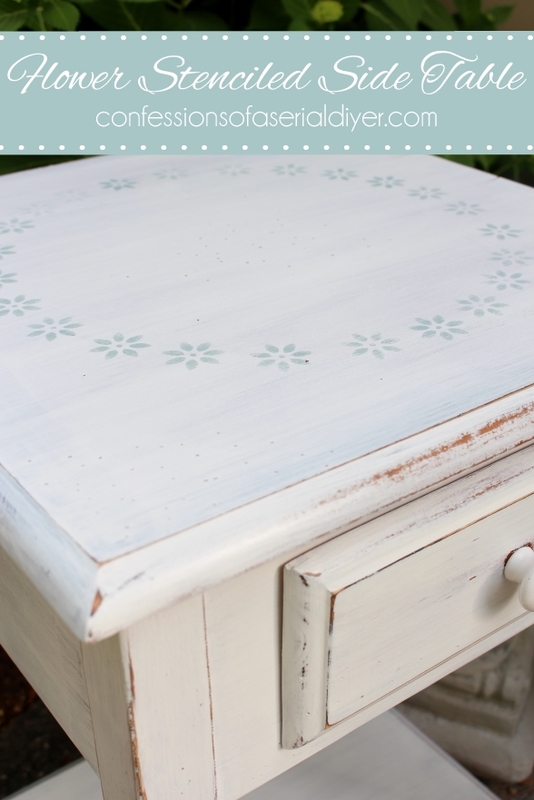 Be sure to visit my friends for more floral inspired furniture transformations! 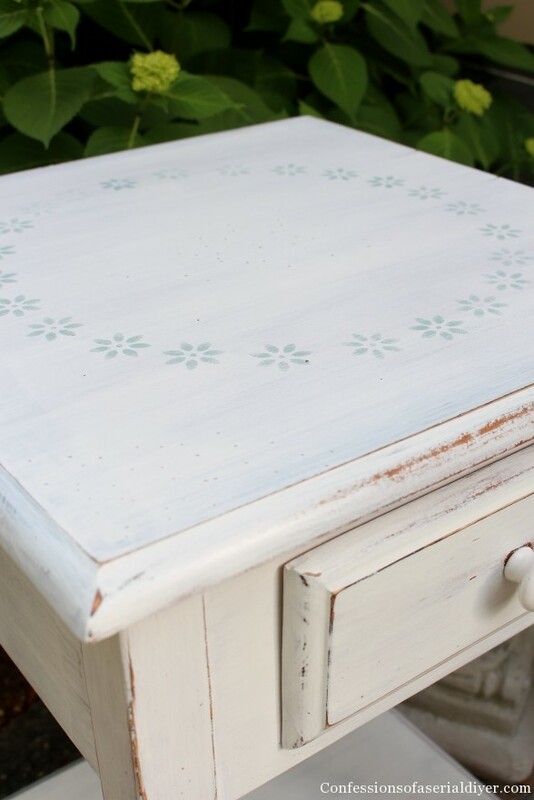 Your side table looks so pretty with the combination of white paint and blue stenciled flowers. 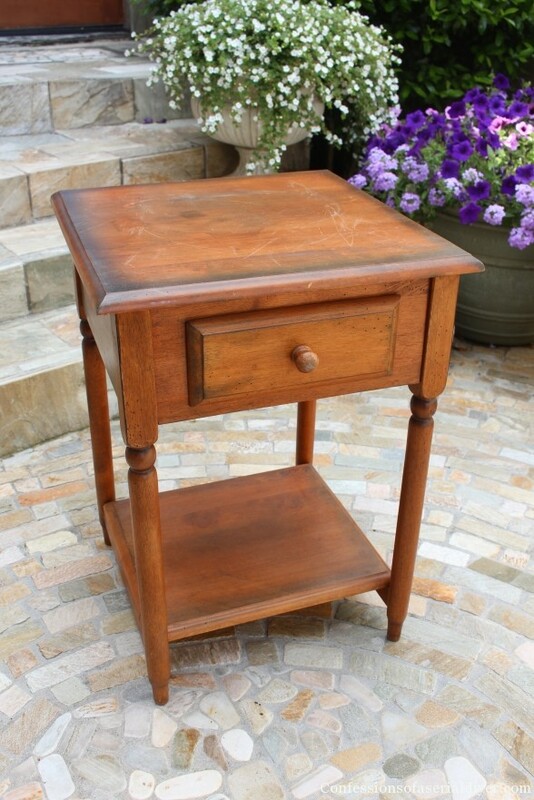 The design of your table looks just like my bedside table made by my grandfather in the 50’s! 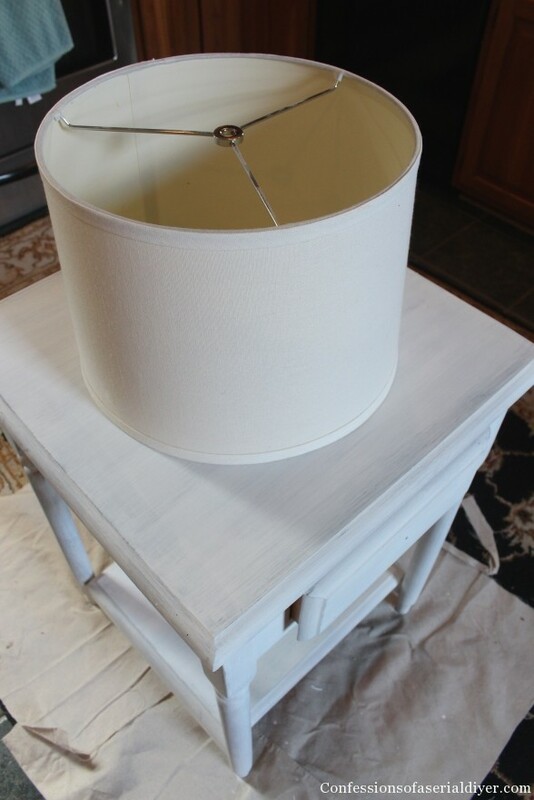 Your idea to trace a circle with a lampshade before stenciling is such a great tip. I need to remember that! Girl, you are so smart. I love everything about this table. I would not have thought to use a lamp shade or anything else to make a circle as a guide. 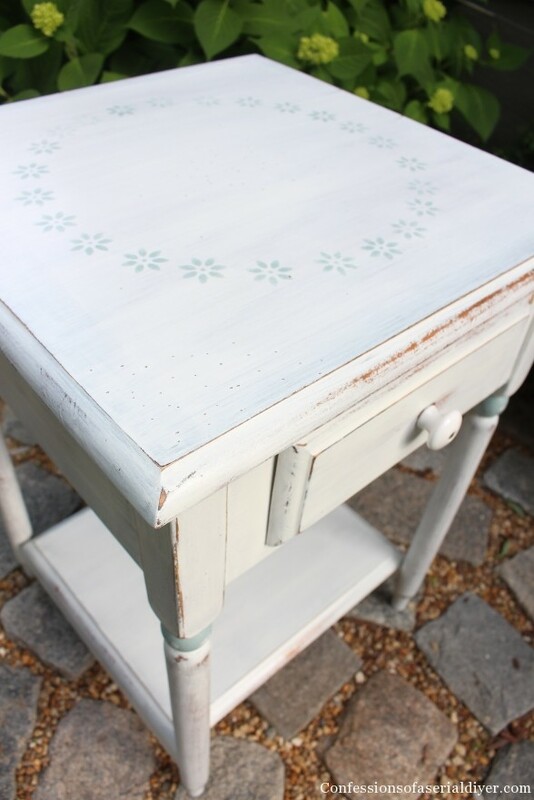 I also love the blue on the legs and the drawer liner!!! Beautiful. 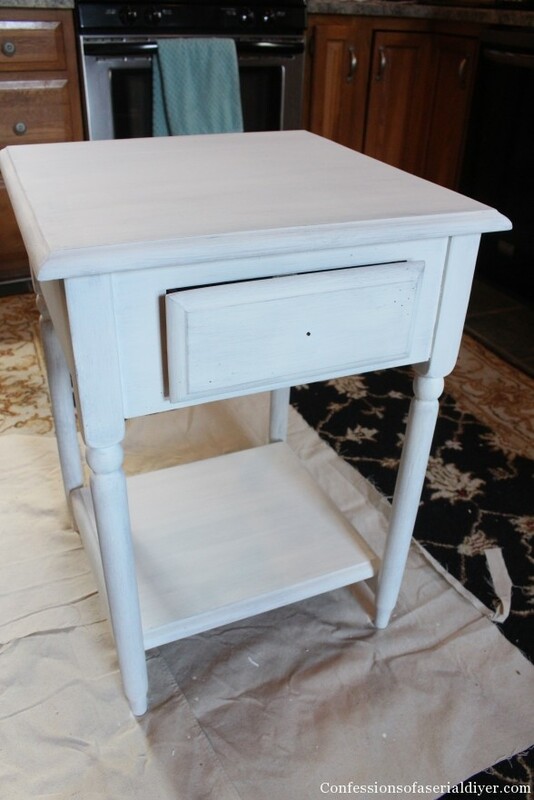 What a cute little table and I love how you refinished it! 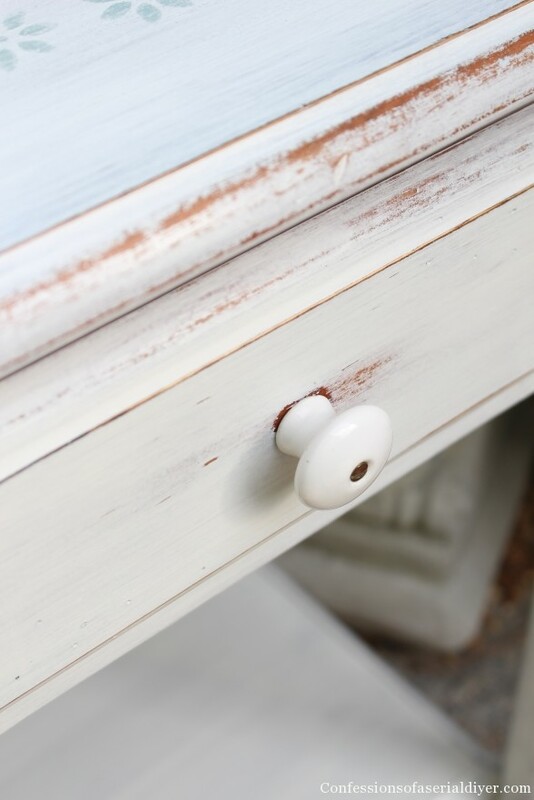 I especially love the lined drawer — it’s those little details that get me every time! So fun being a part of this tour with you! Beautiful! 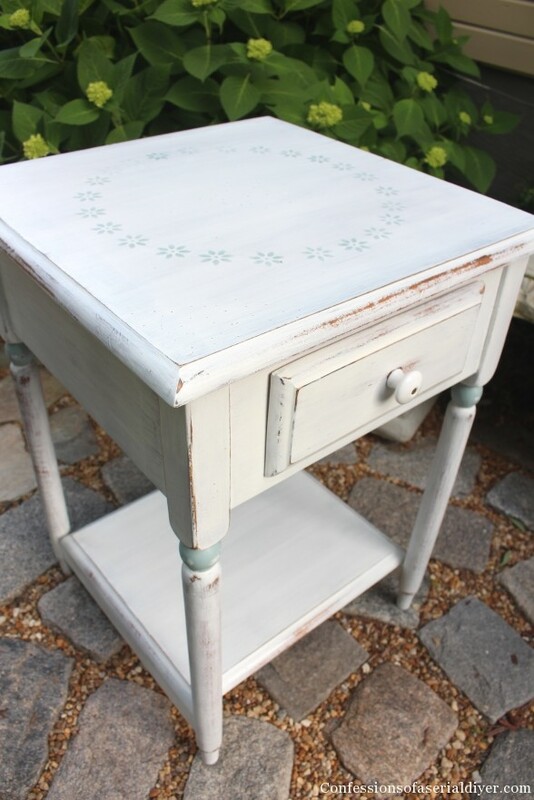 Love the stencilled flowers and the extra hit of blue on the legs! 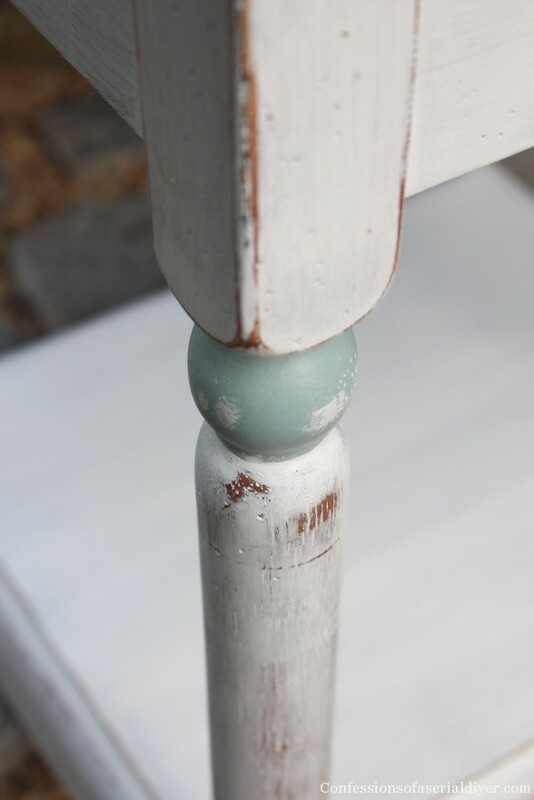 I love the colors, and all the detail you put into such a simple table. The blue is the perfect touch for this table. Thanks for the inspiration. I could just write, see above, for my comment. Agree with all commentors. 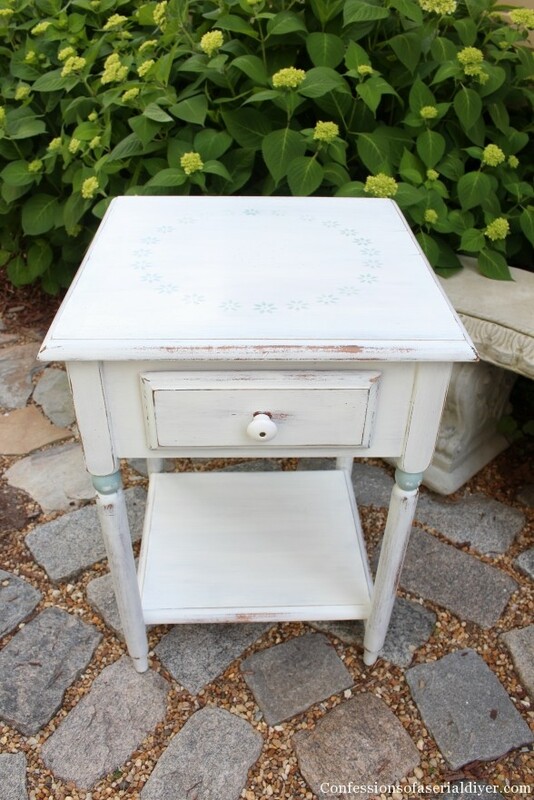 The lines of your little table are so nice and so adaptable to any style idea you’d want to apply to it. I’d love to find a table like that. Love the bottom shelf for books, zines, etc. I like to have place to put m books. 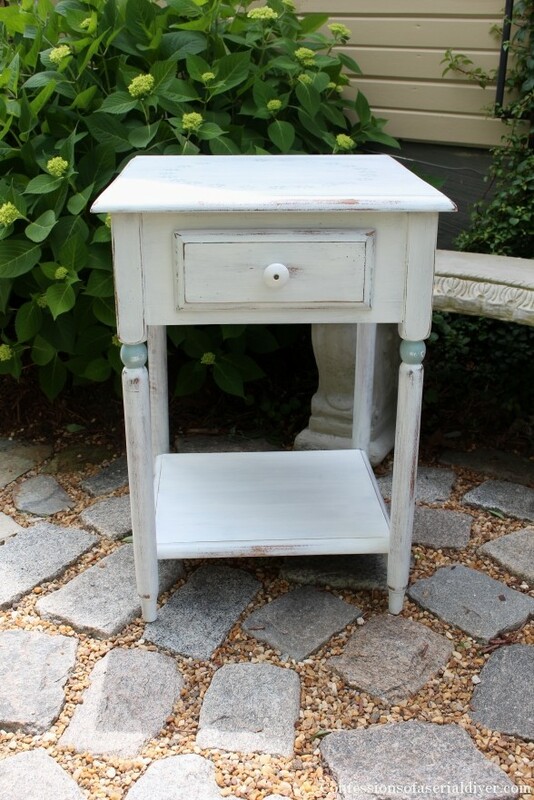 This is such a sweet little table! 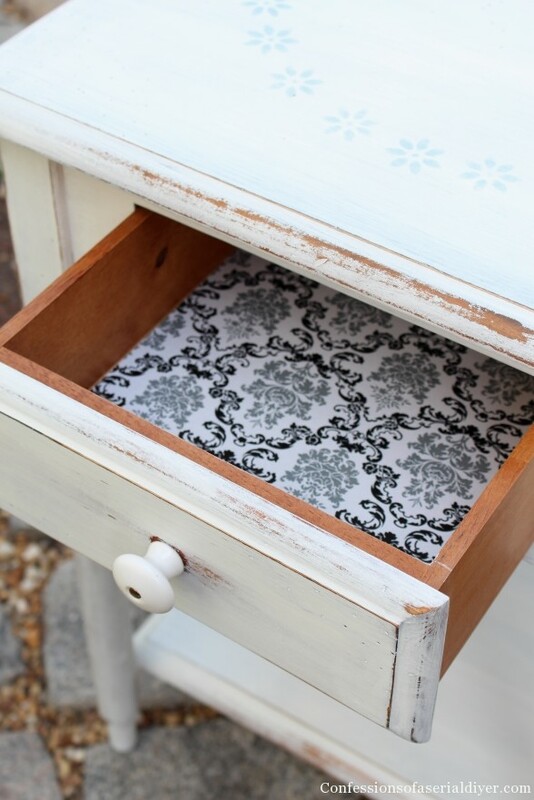 The colors are perfect and I love the bit of distressing and the drawer liner inside! 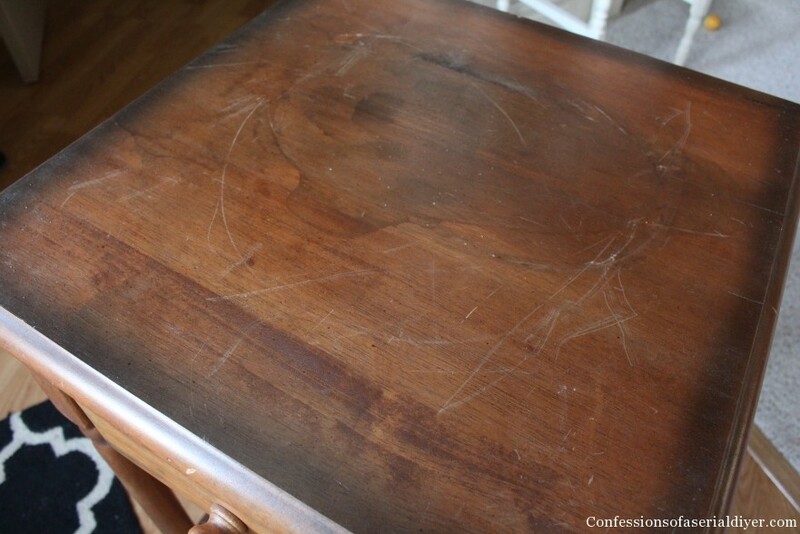 You worked wonders on that little table Christy. I love the clean white with a bit of ruffing up. And your blue flowers really top it off. I found the flowers theme harder to wrap my head around too. 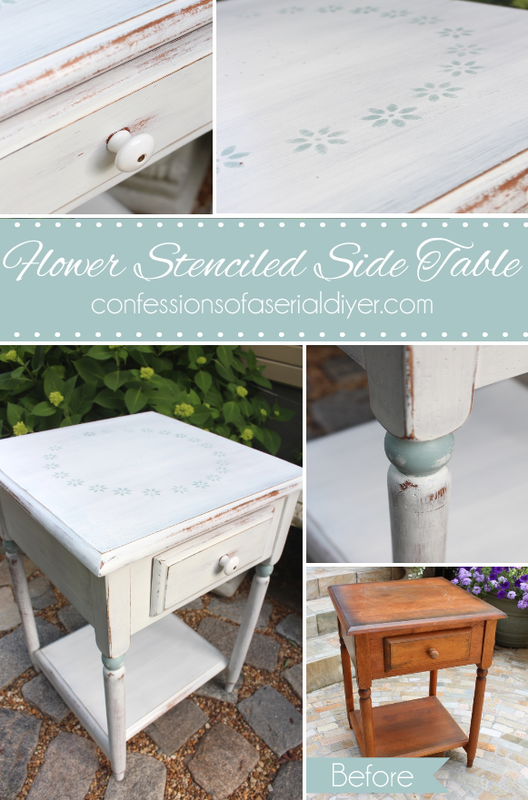 Your stenciling is perfect. Lovely! And I can’t wait to see those hydrangeas!! !